Lembro-me do último dia de 2015. Do frio cortante a varrer as terras dos arredores de Castro Laboreiro. Dos minutos que antecederam a meia noite e da resolução que tomei de não ter resoluções para 2016. Do bem que me soube a liberdade e o desapego de não querer nada. De não esperar nada. O que viesse seria. A primeira manhã de 2016 nasceu como tantas outras antes dela. O céu ainda estava sobre as nossas cabeças, o que é sempre um bom sinal 🙂 . A terra continuou a girar… no entanto e sem que na altura o pudessemos imaginar, no espaço de menos de três meses, vendemos a nossa antiga casa em circunstâncias extraordinarias e mudamos para uma nova – onde finalmente tenho o estúdio como um prolongamento da cozinha – para logo a seguir eu viajar para o outro lado do atlântico para trabalhar num projeto aliciante. Um turbilhão de acontecimentos que nos tomou de assalto com tudo o que implicaram: Expectiva, emoção, alegria, cansaço, desgaste, saudades, muitas saudades e mais do que tudo gratidão, uma imensa gratidão pela infindável generosidade da vida e pelo que ainda está para vir. Agora que já estamos em Abril e que a Primavera deu início a um novo ciclo eu quero mais do que nunca a leveza das horas. E aquelas receitas simples às quais volto sempre nestes dias ainda frios e chuvosos como é o caso dos crumbles, ainda mornos, crocantes e tão frutados, coroados com colheradas espessas e macias de creme fraiche. Simples e ainda assim tão bom! Para este crumble de amoras aproveitei parte das amoras que apanhamos durante o Verão que macerei em água de rosas antes de envolvê-las em açúcar amarelo e amido de milho e cobri-las com um crumble delicioso de amêndoa. É surpreendente a mistura das amoras com as rosas. Os perfumes de cada uma têm notas em comum que se complementam e casam na perfeição neste crumble exótico e aromático. I remember the last day of 2015. The cutting cold sweeping the surrounding lands of Castro Laboreiro. The minutes leading up to midnight and the resolution I made to have no resolutions for 2016. Of the good it felt the freedom and detachment of not wanting nothing. Of not expecting nothing. What would come would be. The first morning of 2016 was born like so many others before it. The sky was still over our heads, which is always a good sign 🙂 The Earth continued to rotate… however and without us even imagining it, less than three months later we sold our old house under extraordinary circumstances and moved to a new one – where I finally have the studio as an extension of the kitchen – and before I new I was travelling to the other side of the Atlantic to work on an exciting project. A whirlwind of events that took us by storm with everything that it usually involves: Expectations, emotion, joy, tiredness, wear, missing my family a lot and most of all gratitude, an immense gratitude for the endless generosity of life and for what is still to come. Now that we already are in April and that Spring started a new cycle, I want more than ever the lightness of the hours. And those simple recipes to which I always return in these still cold, rainy days such as crumbles, still warm, crispy and so fruity, crowned with spoonfuls of thick and soft creme fraiche. Simple and yet so good! 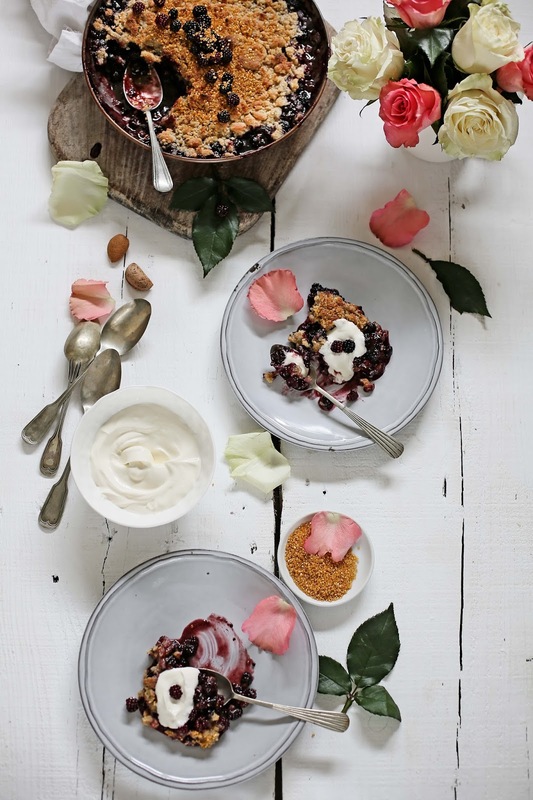 To make this crumble I used the blackberries we picked during Summer that I macerated in rose water before folding them into light brown sugar and corn starch and cover them with a delicious almond crumble. 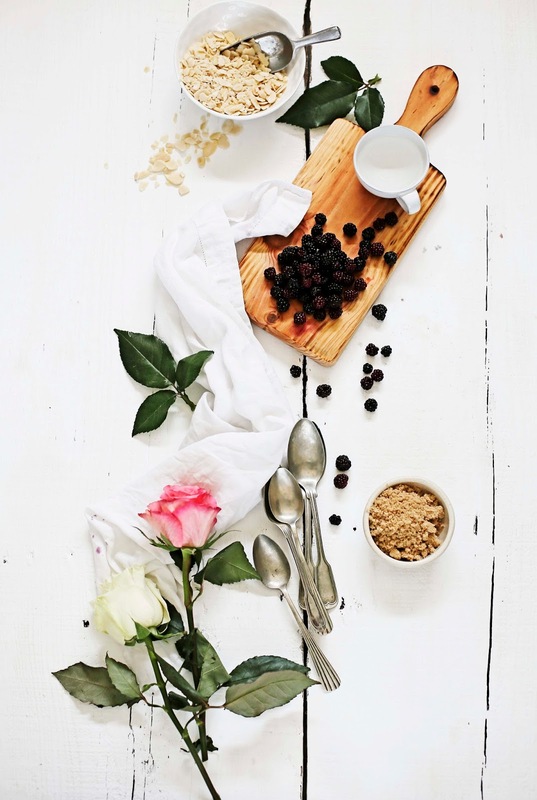 It´s amazing the mixture of blackberries and roses. The perfumes of each have notes in common that complement each other and marry to perfection in this exotic and aromatic crumble. 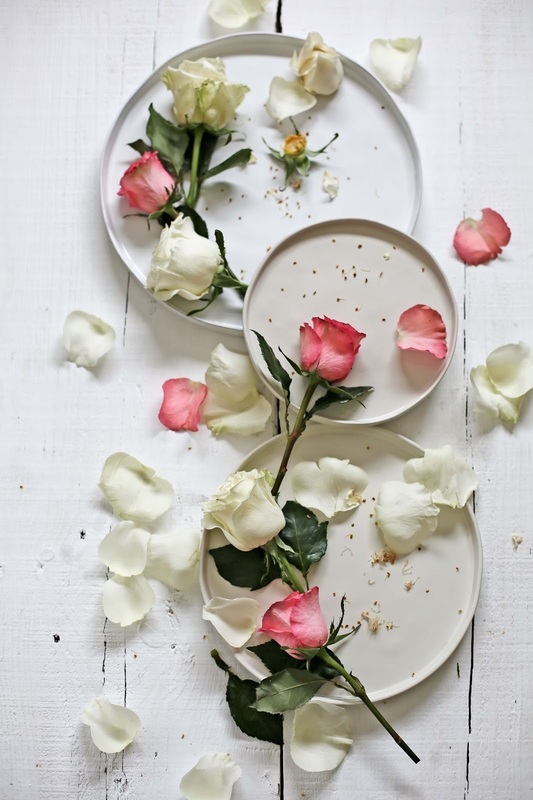 *Regue as amoras com a água de rosas e deixe assim por 1 hora a macerar. *Pré aqueça o forno a 190º, marca 5 do fogão a gás. *Côe as amoras e misture-as com o açúcar e a Maizena, até tudo ficar bem ligado. *Verta as amoras numa caçarola de forno e faça o crumble. *Numa taça coloque a farinha, a amêndoa, o açúcar, a manteiga e o sal. Esfarele tudo com as pontas dos dedos de modo a que fique com uma mistura que lembra migalhas grossas. *Cubra as amoras com o crumble e salpique com açúcar dourado. *Leve ao forno por 35 minutos até que fique dourado e que a fruta comece a borbulhar. Se começar a ganhar cor rapidamente cubra com papel de alumínio. *Tire do forno, deixe arrefecer um pouco e sirva com creme fraiche. *Pour the rose water over the blackberries and let them macerate for 1 hour. *Drain the blackberries, discard the rose water and mix the berries with the sugar and corn starch until well combined. 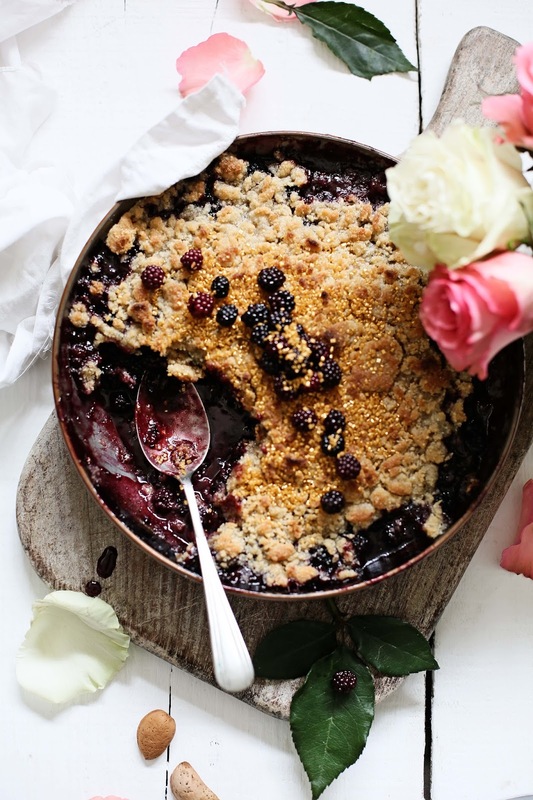 *Pour the blackberries onto a baking dish and then make the crumble to top them. *In a bowl put the flour, ground almond, sugar, butter and salt. Crumble these ingredients with your fingertips until they´ve incorporated all the butter and resemble big crumbs. 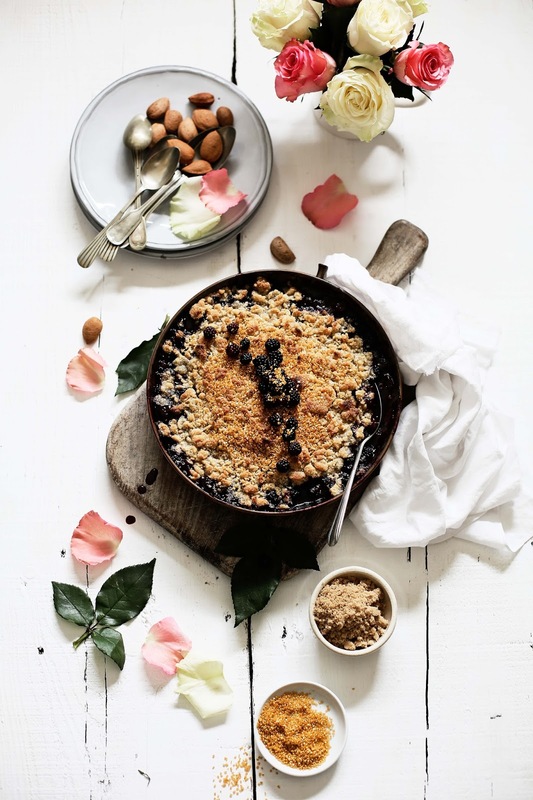 *Top the berries with the crumble and sprinkle with some golden sugar. *Bake for 35 minutes until golden and bubbly. If it starts to gain color to fast cover with foil. *Remove from the oven, let it cool a bit and serve with some creme fraiche. Hum crumble! De amoras pretas nunca comi, têm ar de delicioso! Já fiz de várias outras frutas e todos são maravilhosos!